Cabbage rolls evoke memories of Legion halls, potlucks, and the jingle-jangle of war metals. It reminds me of rushing from car to hall and back again and of trying to find your coat in the jungle of winter clothing necessary to survive a Saskatchewan winter. No one can make a cabbage roll better than a Ukrainian baba but these luscious cabbage rolls do a fair job when there are no Ukrainian grandmothers around! Place the head of cabbage in the freezer. The next morning remove the cabbage and let thaw. This will soften the cabbage leaves to allow for rolling. Remove the tough outer leaves from the cabbage. Use these tough leaves to line the bottom of the casserole dish to prevent burning. Preheat oven to 350. Bring three cups water to boil. Add the 2 cups of uncooked rice and cook as regular rice. Remove from heat while the rice is still slightly undercooked. Saute onions in oil until translucent. Combine undercooked rice and onions in a bowl. Cut tough stems off of cabbage leaves. Place a tablespoon or two of rice on the bottom half of the cabbage leaf. Roll up while pinching in the sides (like a burrito). 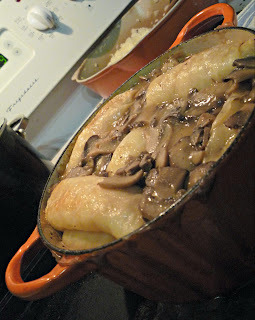 Layer cabbage rolls into casserole dish snugly. Continue until casserole dish is full. 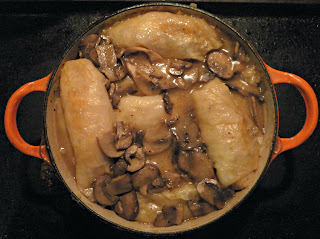 Pour the container of Mushroom Marsala sauce over the cabbage rolls and place in the oven for 30-50 minutes, or until rice is tender and sauce is bubbling. The Small Print: This was one of several sauces I received through a Food Bloggers of Canada cross-promotion. I received five Summer Fresh Sauces as well as an Ikea 365+ wok. Recipes posted within two weeks of receiving sauces become eligible for consideration as a feature on the Food Bloggers of Canada home page.